We're coming home - or maybe we'll stay.......SNOW IN MINNESOTA!!! These were among the words sung in Creole and English--exaltations lifted up to heaven from the homes of the Healing Haiti elders today. 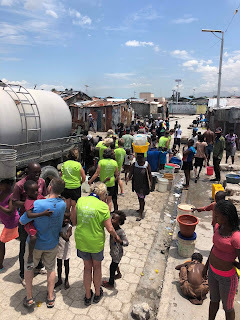 Our team, guided by Jonas and Valery, visited these precious people and sang hymns with them such as Amazing Grace, Praise Ye the Lord, Blessed Be the Name of the Lord, and Glory to God. We also washed their faces, arms, and legs. We massaged their shoulders and their hands. We laughed with them and danced with them. 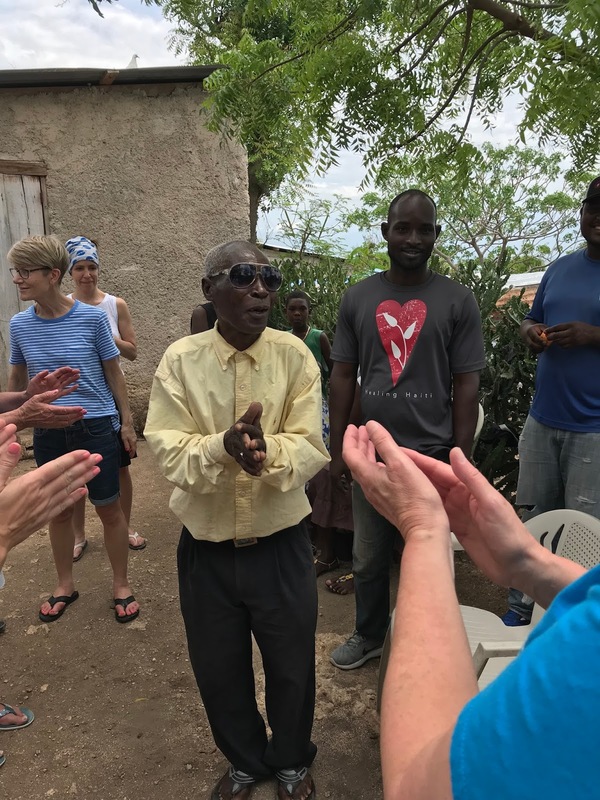 But it was the songs that I'm humming tonight, remembering the looks of joy on the faces of the elders who have come to think of Healing Haiti as Jesus' hands and feet. Earlier in the day we visited Grace Village where Jake talked with us about how God has blessed the efforts of Healing Haiti with the success of Fleuri bakery and restaurant. After visiting an orphanage where we played four-square, hopscotch, and colored in coloring books, with the children we got back in the tap tap to make our way home. We shared dinner, devotionals, and prayer time with our leaders Lisa Olson and Barb Larson. We are now heading to our bunk beds where we'll fall asleep talking about the highlights of our day. We'll each have our own special moments to which we'll drift off to sleep. Mine will be the beautiful voices raised in perfect harmony giving Glory to God. On days when a Healing Haiti team of volunteers comes, the people know they will have help carrying their water and the kids come in droves to be held, played with and today, just wanted some of us to sheta/sit with them. 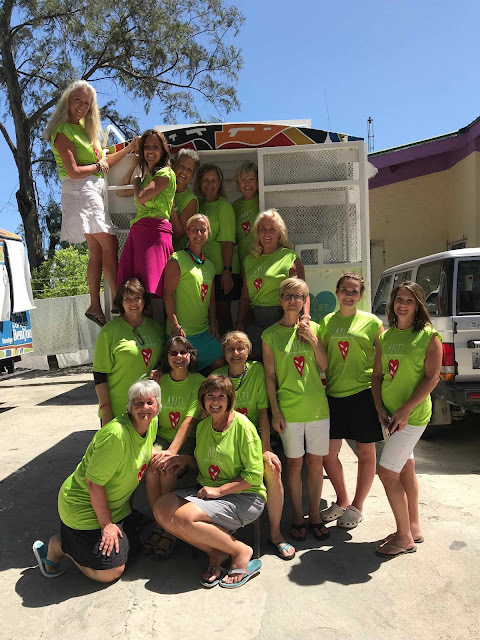 Being part of this team of women, several of whom have never been to Haiti or any 3rd world setting, worked together and dove right in. I spent most of the day under the water spout pulling buckets in to place and passing the filled ones out to the waiting people. At 1 stop I immediately noticed a very pregnant lady patiently waiting with 1 bucket. People had formed a line but many tried to squeeze in to the front - she just waited. The midwife in me could not help but go and take her bucket. I filled her bucket and we left together to carry it to her home. As we traveled back among the homes we came to a large puddle of water and debris and she stopped me, smiled and said 'no". She did not want me to have to cross the puddle. Kindness. Without words, we communicated much with smiles and "merci" and parted ways. The truck refilled and returned to a 3 different areas times. We filled bucket after bucket until the entire tanker is empty. Water is life here. It is hard to actually describe in words. You'll have to wait for the pictures to understand. 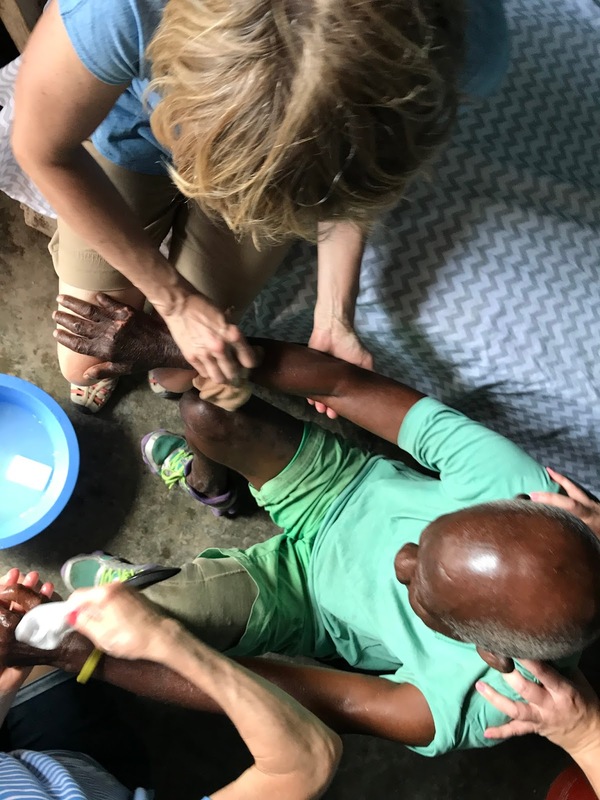 Healing Haiti has built a trust based on a steadfast long term relationship. This legacy of trust made us immediately accepted. 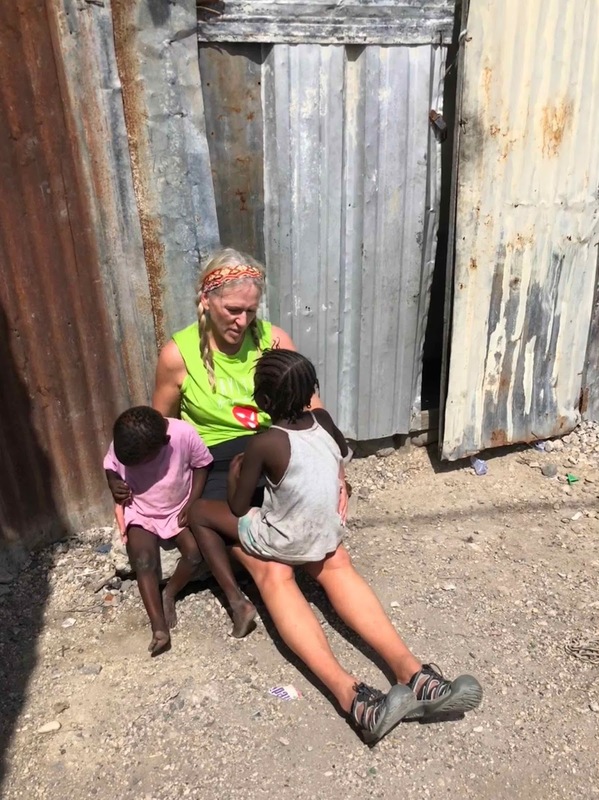 I marvel at the opportunity to be in places that give me an intimate view of Haitian life and to be allowed to serve there. I came here with an attitude that God has a gift, a lesson for me. I arrived open to what ever comes my way.- no expectations except that my life will be enriched, blessed. There is a joy in living a life open to God's touch and leading- no fear. Haiti gets in to your heart, it is a hard place, yet I love being here. Life can be amazing outside of your comfort zone. This is team member Willi Pederson. It was wonderful to start this day seeing all of our team members finding little corners to do their own personal devotions. I love the hearts of my team members and it is a privilege watching them living out their personal time with the Lord. After breakfast we headed out in the TapTap to Teen Challenge. Riding the TapTap is an experience in itself! We all pile in the back of a Fed Ex size truck that has benches on the side and wire mesh up to the roof & hang on for the ride! Roads are very rough and bumpy and we are hanging on for dear life as we look out and see the Haitians "doing life". I saw a woman balancing 8 dozen eggs on her head walking up a steep hill. The physical strength and balance of Haitians is amazing! At Teen Challenge we were introduced to the students and the programs. It is a 18 month program for teens who have come out life challenges hard to imagine. Most have been sexually abused and many orphaned. They grow up in an environment impossible for us as Westerners to comprehend. At Teen Challenge they learn what it is like to live with a roof over their head, protected physically, and learn to know Jesus learn life skills. They will stay there for 18 months and then go back to their communities to be the light of Jesus. Their joy was undeniable. I gave my personal testimony of redemption through an interpreter. The girls were on the edge of their seats & applauded when if finished. I wanted them to know I had made plenty of bad decisions in my life and how redeemed we all are. We are all, indeed, sisters in Christ. Afterwards we treated the girls to manicures, pedicures & facials and the braided our hair. It was a sweet time of international sisterhood we will take into eternity. My heart was full as we left. In the afternoon we went to orphanages where we fed & held babies and played with the older children. They had health issues - many very malnourished and so small for ages. Most are orphaned or abandoned. Touch is universal and all of them longed to be held. One particular little girl attached herself to me and called me mama. It made me weep - I physically could not be a mother, so to be called mama was a bigger gift than that little girl will ever know. At one point she crawled up my back & just wanted to play with my blonde hair. When I became overwhelmed, this sick little girl patted me on my back to comfort me. A moment in time etched in my memory forever. At evening devotions we each shared memories of the day. Journeying with these sisters in Christ is another indescribable memory. For the first time since arriving, I slept soundly tonight after my cold water shower. I am blessed beyond my wildest dreams.